Well, it’s officially Autumn. The Pumpkin Spice Apocalypse is upon us. So I figured I had better get this posted up so you any of who you are feeling nostalgic for summer can whip it up before we’re hip-deep in multicolored tree parts. 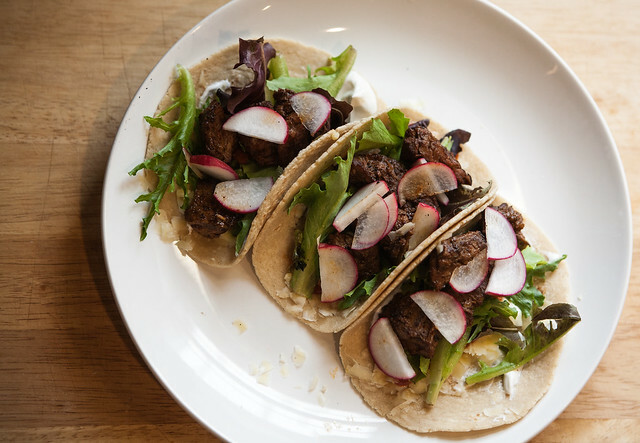 Not that you can’t make tacos year round – I totally do, anyway. It’s just that tacos seem like summer fare to me. They’re so fresh and light, and you eat them with your hands while the juice runs down your chin. It’s not just me right? You guys do that too? Well you definitely should. I had this put together in less than an hour – and you could use any leftover meat you had if you wanted to streamline this even more. I used skirt steak because it’s cheap but it has really good flavor. And if it can be a little tough, well, it’s tacos, and you’re gonna slice it (against the grain!) pretty thinly anyway, so it doesn’t really matter. The rub I used was perfect for this – it was pleasantly spicy and very flavorful without totally overwhelming the beef. I think that rubs, marinades, etc should be flavorful enough to compliment whatever meat you’re using while still allowing you to tell what you’re eating. This one was spot on, and I’ll definitely be using it again. I like to use soft tortillas as my base, and I use a pretty simple mix of toppings. A little cheese, mixed greens, sour cream, cilantro, sliced radishes, and a little red sauce (hot sauce, taco sauce – your choice). Oh, and squeeze a lime over top – the acid is a nice addition. Yes, I realize this is the American form of tacos, and not at all authentic, but I’m OK with that. After all, this is America, and I happen to like it. I have a really great Fig Focaccia to share with you in a day or two, but in the meantime: Farewell Summer! Happy Autumn! On a work surface, crush garlic cloves using the flat side of a large knife; sprinkle with 1/2 teaspoon salt. Place the flat side of the knife blade on top of the garlic and salt; press firmly, pulling knife toward you. Repeat until a paste forms; transfer to a small bowl. Add chile powder, brown sugar, paprika, cumin, pepper, espresso, and remaining tablespoon salt; stir to combine. Rub mixture all over skirt steak, and place in a large freezer bag to marinate for 30 minutes. Preheat grill pan* over high heat, or use an outdoor grill. Place steak on grill, and cook for 3 minutes per side for medium-rare. Let rest for 5 minutes before slicing. Serve thinly sliced steak in warmed tortillas; top with salsa, cilantro, cheese, sour cream, lettuce, and lime wedges, if desired. *I used a cast iron griddle and it worked perfectly.